Running a chiropractic practice is no easy task. Chiropractic treatments usually take longer and require frequent visitations, as a result of which focusing on the other related tasks becomes quite difficult. Are you facing reduced fee reimbursements but cannot understand how? Are you facing an ever-increasing amount of complex documentation? Are most of your patients routinely post-dating their payments and there is no one to follow them up? At Outsource2india, we have years of experience in providing the highest quality chiropractic billing services which help to simplify your practice while maximizing your revenue. We provide complete chiropractic billing for hospitals, clinics, and large healthcare providers including chiropractic coding and AR management. We understand that to set up an efficient billing process, we need to understand our clients’ requirements, and integrate their existing software with our services. For the same, we customize our proprietary software after understanding your needs and the existing capabilities of your current system. The integration takes place seamlessly and leverages the latest cloud deployment protocols and secure channels so that your practice management system gets off to a flying start. Once we integrate with your existing system software, we begin by securely transferring patient data as soon as it is captured on our systems. We can also securely access your practice account with the correct credentials, provided only on a need-to-know basis. This helps us to carry out functions such as adjusting patient ledger balances, insurance claims dispatch, etc. We establish the framework for chiropractic medical billing and the underlying medical billing codes first and foremost. Thereafter, we implement all other service requests such as denial management, accounts receivable management, insurance processing, etc. as mentioned by you. Once the processes have been securely set up and the trial run is successfully completed, we begin with the collection process while ensuring the revenue stream is correctly optimized for your practice. We helped a Maryland-based medical billing company with the best-in-class medical billing and coding services and helped them clear their backlog within a turnaround time of 12 hours. Why Choose Outsource2india for Chiropractic Medical Billing? Certified Processes - All our software and service processes are certified according to HIPAA, ICD 10, ICD 11, DSM 5, RBMA, and ISO. This ensures you never have to worry about changing regulatory formats. Data Security - Our infrastructure and our processes are compliant with the latest security protocols and have multiple levels of redundancy so as to ensure your data always remains secure. 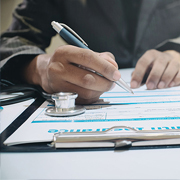 Accuracy - Our medical billing and coding team have a minimum experience of 5 years, and ensure all records are maintained correctly and with 100% accuracy. Quality - All our processes are ISO-certified, and throughout our contractual period, we ensure that strict quality standards are set and always met when collecting patient data, contacting insurance providers, and setting the correct medical codes to your patient procedures. Swift Turnaround Time - Clients across the world swear by our TAT, as our simplified processes and cloud-based infrastructure allow us to reduce the time required to perform day-to-day tasks. Flexibility and Scalability - We pride ourselves on our ability to scale up or down as per our client’s requirements. Often, your request for more personnel can be met within hours, while ensuring the same quality you have come to expect from us. Flexible Pricing Options - You never have to worry about inflated prices anymore as our flexible pricing allows you to have a transparent outlook of what to expect. Dedicated Project Managers - Outsourcing chiropractic billing can be a challenging experience, and that is why we ensure a dedicated project manager is assigned to your project to serve as a single point-of-contact for your business. This ensures peace of mind and quick reporting for all our actions. Experience - With over 15 years of experience and with more than 100 satisfied clients under our belts, you can rest assured that you will be dealing with a professional billing service provider for your requirements. Infrastructure - O2I leads other service providers when it comes to infrastructure, as our custom software and cloud-based options have stood the test of time while incorporating the latest security protocols for enhanced peace of mind. This further allows us to deploy multiple file-sharing options for our clients to choose from, all 100% secure and readily available as and when required. 24/7 Availability - The team assigned to your project is available 24/7 to take your demand requests and changes if required. Our teams work in shifts, and therefore there is always someone available and working on your project. The quality of your work is outstanding. Seems the people you have on our tasks are knowledgeable about the process & are doing a good job on following through on things. Overall great job and we appreciate all the help. At O2I, we have delivered hundreds of successful projects for clients across the world. We like to believe that our services and our experience speak for themselves, and when you outsource chiropractic billing services to us, you partner with a skilled service provider who can eliminate inefficient revenue generation, fix the leaks, and return you on the path to profitability. Contact us right away to know more about how we can streamline your existing workflow and optimize revenue collection.